Taking down an enemy from a distance in Fallout 4 sure is a fun and challenging thing to do, but what about the ammo? What about positioning? Not always will you be able to safely take them down, not caring about the ammo. That’s why you must have some melee weapons in your inventory. In this article, you’ll be able to see what are Fallout 4’s best melee weapons. We’re starting off our list strongly and that’s why you’re seeing the Pickman’s Blade first. 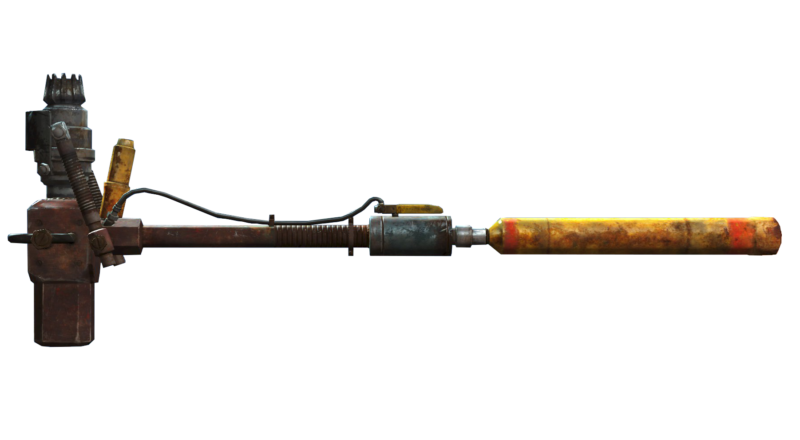 If you’ve ever had the chance to hold this weapon, you know for sure that it’s definitely one of the best melee weapons that you can possibly have in Fallout 4. The reason for being that its attack speed (AS) is very high, and we all know the difference that high AS brings into the fights and the bleed damage. This knife, in particular, has both regular bleed damage (25 points) as well as additional Stealth Blade Upgrade bleed damage (another 25 points). Dealing this much damage with just one hit is absurd. Pickman’s Blade’s base damage is 30 and its DPS (damage per second) is 59.9. With fast attack speed, this weapon is quite lethal. If you wish to find and use this knife, you’ll have to complete the Pickman’s Gift Quest and obtain it as a reward in a safe, which can be found behind the painting in Pickman’s Gallery. Since we started off tough, let’s keep it that way! Furious Power Fist does not only look brutal and amazing, but it also deals a ton of damage. The thing that makes this weapon so awesome is that the more you attack the same enemy, the more damage you deal to him! Aside from that, it’s good for taking down high-HP enemies. Needless to say, if you upgrade this baby with some awesome mods, you’ll be indestructible. Furious Power Fist’s base damage is 28 and its DPS is medium. When combined with quite good AS of 23.8, you get a real murderer in your hands. In case you’d like to get hands on this one, you’ll have to go through the real trouble. You can get the regular version, The Furious Fist, by defeating the Edger Swann in the Swans pond (top of the Hubris Comics). However, in order to get the Furious Power Fist, you have to defeat the Swan which can be found somewhere in the middle of Bostom Common pool (swan pond). This fight won’t be easy, so be careful! Just like we promised, we’re keeping it tough! Next on our list is a melee weapon that has the absolute highest base damage – it’s the Kremvh’s Tooth. As usual, feel free to upgrade it and just harass your opponents with it. One of the coolest things about it is that you can transform it into awesome machete just be removing the mod from the tooth and putting it on the machete part. With the help of poison, it can shred enemies with ease. Kremvh’s Tooth has 59 base damage, 50.2 DPS, and medium attack speed. In order to find it, you’ll have to dive deep into the caves at the Dunwich Borers. Go near the Salem Witch Museum and fight it towards the chamber at the bottom. Once you spot the pool, jump into it and head to the underwater chamber, and there’s the Kremvh’s Tooth! One of the Chinese officer swords is the General Chao’s Revenge. It has cool base stats, but one feature makes it amazing in certain situations. Dealing with Assaultrons – not a problem! Just grab your General Chao’s Revenge and take them down! This weapon deals 50% more damage to robots. 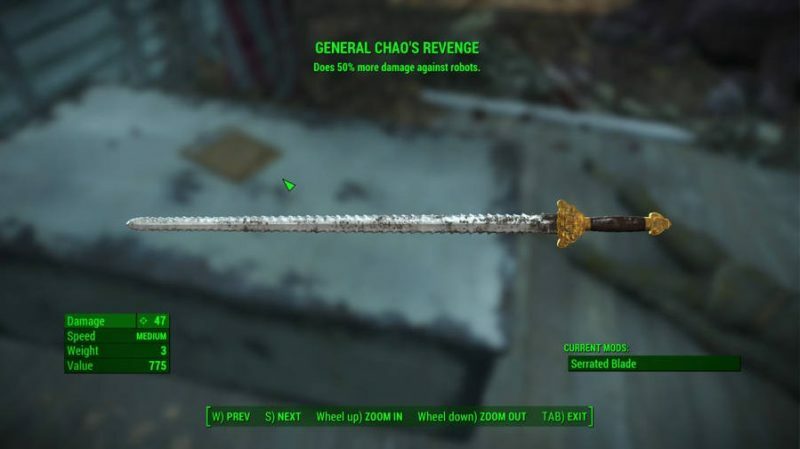 General Chao’s Revenge has 40 base damage and 40 DPS and combined with medium attack speed, it’s quite devastating. Getting this weapon requires you to finish the side quest with Wolfgang, after which you can buy it for quite a price, from Trudy the merchant. When you’re in some kind of a trouble, you better wish for the Grognak’s Axe in your inventory! Aside from heavy damage that this axe can do, it also causes enemies to bleed and stumble, allowing you to zone out of the hard mess. However, this isn’t the best part. This weapon’s AP usage is actually reduced when you’re in VATS. Therefore, you can strike way more often than you can with other weapons! Grognak’s Axe’s base damage is 35 and DPS is 29.8. With medium AS and the features that we’ve mentioned, it makes up to a great melee weapon. You can find it in the Advanced lock which can be found inside Hubris Comics. Still going hard at it, next on our list of Fallout 4’s best or strongest melee weapons is the Deathclaw Gauntlet. These claws are one of the historic weapons that Fallout 4 has, but they rock harder than most of the other melee weapons! These ripping claws allow you to dominate your opponents with ease. 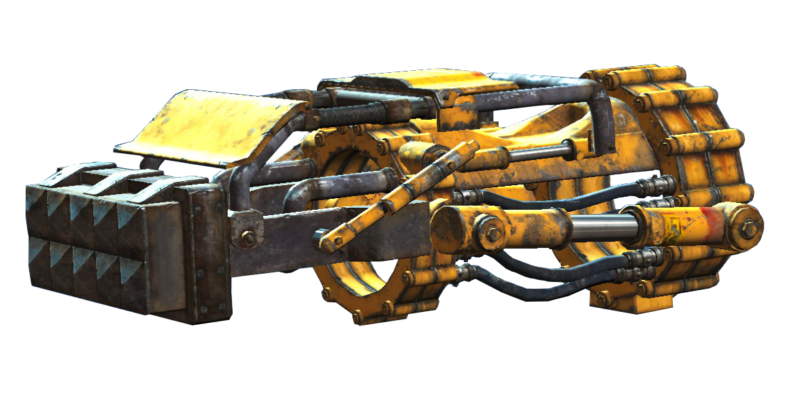 We suggest upgrading this weapon so that you get the third claw which increases damage towards disarmed opponents and definitely make sure to work on the iron Fist Perk. Deathclaw Gauntlet’s base damage is 35 and its DPS is 29.8. Medium AS makes these claws quite strong and dangerous, so use them wisely! Getting them is easy – either get them from the merchants once you’re past level 20, or complete the side quest Devil’s Due. So far we’ve been covering the best melee weapons in Fallout 4 that can help you demolish enemies, but we still haven’t covered the ones that can actually help you in defense. Super Sledge is a great defensive weapon and, even though it’s super heavy, we recommend you to have it by yourself for the god-forbid situations. The reason why this weapon is defensively good is that it has high DPS and quite a range, so you can safely fight your enemies. Some stunning or shocking upgrades are more than welcome! Super Sledge’s base damage is 56 and DPS is 30.8. Even though it has low AS, the output can still be lethal. Thankfully, this weapon is quite easy to obtain. There are two ways of obtaining this weapon. You can buy it in Common Wealth Weaponry in Diamond city, or you can buy it from the K-L-E-O in Goodneighbor. For the rest of our list, we’ll be talking about almighty swords and the first to begin with is Zao’s Sword. This one represents the stronger version of Chinese Officer Sword, which we’ll mention next, and it can be upgraded so that it deals bonus electrical damage. We all know that early levels can be much of a trouble when it comes to fighting weapons, and that’s where Zao’s sword comes in handy! Achieving higher levels is easy with this weapon, and it allows you to get your hands on some of the better weapons. Zao’s Sword’s base damage is 32 and DPS is 22. With its medium AS it’s quite decent early-level melee weapon. Zao’s Sword can be obtained by completing Here There Be Monsters quest and convincing Zao three times. As we’ve mentioned, weaker version of Zao’s Sword is the Chinese Officer Sword. Even though it does allow fast attacks, it still doesn’t provide too much damage because of the low base damage and DPS. On top of lacking damage, it’s not that easy finding it so this sword is one of those that are not really worth going through the trouble for. Although you can always add some electrical damage to this weapon, making enemies bleed! Chinese Officer Sword’s base damage is 22, DPS is 18.7 and it has medium AS. You can find it in a dresser in Yangtze Submarine, or you can buy it from Arturo Rodriguez in Diamond City. Last but not the least is the Shem Drowne’s Sword. This melee weapon isn’t too strong but its damage relies on the radiation damage. Unfortunately, you can’t get this weapon in the beginning, so make sure to use it wisely once you get it. Also, because it’s not that strong, getting a stronger melee weapon is a must! Shem Drowne’s Sword’s base damage is 24, DPS is 20.4 and it has medium AS. Once you complete the Gilded Grasshopper quest, you can get this sweet sword. Just search for the file in Nick Valentine Office! What’s your pick on the best melee weapon in Fallout 4? Well, folks, that would be it. Hopefully, you’ve found out stuff that you didn’t know before or at least you got to take a look at our Fallout 4 best melee weapons list. We, as Fallout 4 fans, strongly believe in dueling and outplaying enemies and therefore we find melee weapons best choice for fighting! Do you not agree with our top weapons list? Make sure to let us know of your top list!